On Saturday September 29, 2012 I gave birth to my beautiful daughter Breea DeVon. On the morning of Breea’s birth (one week before her due date), we went as a family to Nauman’s Pumpkin Patch. Our son, Emmett (almost 2 years old) was pretty grumpy and spent most of the time in his stroller but we had fun looking at all the pumpkins! We purchased four pumpkins to make a ‘pumpkin family’ for Fall decorations. Because of my struggle with back pain, it did not take long for me to be uncomfortable and sore while walking around. We planned on spending the rest of the day at home to relax. Once the house was quiet, Russ and I had supper together and started to watch a movie (Blast from the Past). 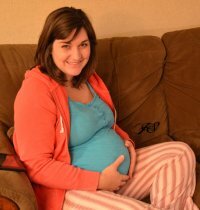 My contractions started around 7:55 p.m. while we were watching the movie. We began to time them. They were very bearable at this point (just felt like tight period cramps). I could tell when they would start and finish but they were not painful. The contractions were approximately 1 minute long every 5 minutes. They were consistent but bearable. I had a shower around 9:00 p.m. We called Pooja again around 9:45 p.m. to tell her that things were progressing and she came at 10:00 p.m. to check my dilation. 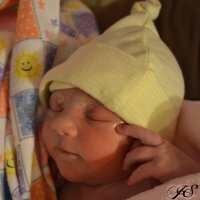 I was only 1-2 cm dilated around 10:05 p.m. Pooja decided to bring her equipment in and set up the room in case things progressed quickly (my last birth was very fast). We set up in the master bedroom where we planned to give birth. While Pooja was setting up, I talked on the phone with my mom about when she should come over to help (I wanted to have her at the birth again) but since I was only 1-2 cm dilated we thought there was more time and she could come over later. I was managing okay on my own with Russ at this point. 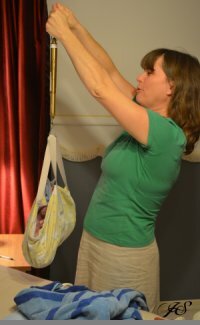 I continued having contractions in the washroom with help from my husband. I remember having a large contraction leaning over the bathtub on my hands and knees. From here, we moved to the nursery because I wanted to try being on the floor and using the rocking ottoman for support. The room was dark with very dim lighting. I found that the rocker ottoman worked well for support, and I could rock through the intense pain. At 10:55 p.m. we called Pooja to come back. At 11:00 p.m. I had an urge to push and screamed, “I can feel the head!” There was no crowning yet but this was a very intense time, and I was finding it difficult to control my breathing. Apparently Russ was freaking out in his head but he did well at remaining calm for me. We were both very eager for Pooja to arrive! Midwife Julie Corey weighing baby Breea. At 11:05 p.m. Pooja arrived and went straight upstairs to find me kneeling on the floor using the ottoman for support in the nursery. Pooja checked that it was safe to push and I began pushing. Russ and Pooja quickly moved the shower curtains from the master bedroom to where I was in the baby’s room. They arranged the rest of the towels and organized Pooja’s birth equipment. After a few pushes, the baby’s head arrived and was looking straight up. (I was still on my hands and knees at this point using the ottoman for support). A few more pushes after that and the rest of the baby arrived! 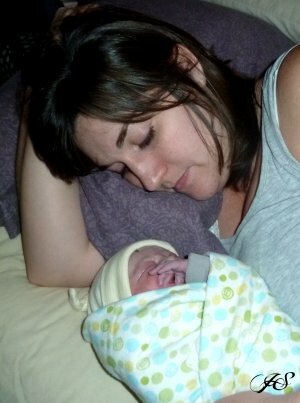 Breea DeVon was born at 11:14 p.m. on the floor of her own bedroom in our own home—drug free! She was 7 lb 1oz. Pooja passed the baby between my legs so I could hold her. We checked for the gender and Russ declared, “It’s a girl!” (we did not find out the gender prior). Russ and Pooja cut the umbilical chord and then I leaned back and sat on the floor, propped up by pillows. 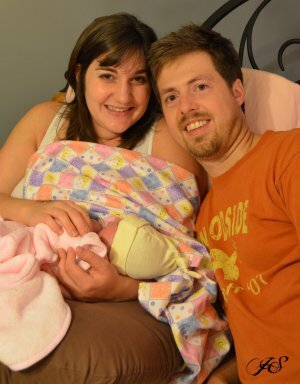 The placenta came at 11:17 p.m. Julie (my second midwife) arrived at 11:25 p.m.
Jennifer and Russ with baby Breea. Both midwives were super amazing with clean-up, guidance, drawing a bath, weighing Breea, etc. Russ called my mom shortly after giving birth to tell her that, “We have a daughter!” She was in shock and surprised that it had all progressed so quickly! She came over to help and arrived just as I was getting in the bathtub with Breea. (It was at this point that Russ and I confirmed Breea’s name and spelling). After having a bath with Breea (she pooped while in the tub! ), I went to my bedroom and sat up in bed to nurse Breea for the first time. This is when Breea was weighed for the first time and the midwives did a few other things with her. We spent the rest of the evening cuddling Breea and recapping her intense, exciting arrival. I remember Breea slept very well the first night. We are so thankful for the care and attention we received from our midwives at St. Jacobs Midwives.